Volume 10, Issue 29; July 21, 2010: Why Don't They Believe Me? The Boy Who Cried Wolf, illustrated by Milo Winter in a 1919 Aesop anthology. 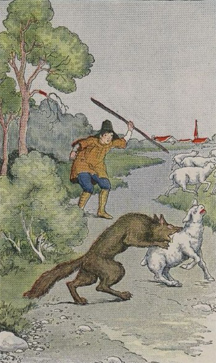 This fable, attributed to Aesop, tells the story of a shepherd boy who repeatedly — and falsely — alerted villagers that a wolf was attacking his flock. He did this as an entertainment. Finally, when a wolf actually did attack his flock, the villagers didn't believe him. He had lost all credibility. In this case, the loss of credibility was due not to any of the behavioral factors described here, but to deliberate disinformation. Disinformation does occur in organizations, but it is much less common than the other factors, and it falls outside the realm of factors that degrade credibility without your actually being wrong. Other similar factors include deceits of various types, baseless accusations, ethical transgressions, and associations with others similarly inclined. Photo courtesy Project Gutenberg. Whether you want to advance your career, or just keep your job, credibility matters. It's a basis for trust. It determines what assignments come your way. And when things go wrong, credibility can protect you from accusations, real or false. If you have credibility, it's easy to forget that you do. But after you've lost credibility, you notice its absence almost everywhere you turn. Sometimes it's easy to understand why you lost credibility. Mistakes, for example, can do it. One or two spectacularly avoidable blunders can pretty much finish you off. But a string of less-than-spectacular errors can erode credibility too, if there are so many of them that they become predictable. More interesting are the behaviors that erode credibility without your actually being wrong about anything. Here are some attitudes we project that erode credibility. Sometimes being believed — about almost anything — becomes so important to us that anxiety and desperation become evident. This can arouse suspicions that being believed is more important than being right. Others believe that we might even lie to ourselves and thus become incapable of knowing the truth. Nobody likes — or more to the point — nobody believes a know-it-all. People generally have difficulty accepting that someone can know it all, perhaps because it reflects on their own limitations. But even if we actually do know it all, others can become determined to demonstrate that there are limits to any one person's knowledge. They can do that through disbelief. An attitude of disrespect for truth projects a disregard for the difference between truth and fiction. Nonchalance about being mistaken can give others cause to doubt that we care about the truth of what we say. Uncertainty and confidence are linked to credibility in a paradoxical way. The more uncertain we are, the less credible we are. The more confident, the more credible. This seems only sensible. But paradoxically, the more competent we are, the less confident we seem. The less competent we are, the more confident we seem. Read more about this in "The Paradox of Confidence," Point Lookout for January 7, 2009.
become evidentbelieve we have motives other than surfacing Truth, they tend to question our claims even when those claims are true. For example, if we have contempt for some of the people involved in the topic at hand, or if others suspect that we wish them to fail, our questions, skepticism, and words of warning will likely be ineffective, or even anti-effective. Would you like to see your comments posted here? rbrenlmiwejPUiIVBnWHJner@ChacmULVUoBThcjAILcqoCanyon.comSend me your comments by email, or by Web form. The theory of symbolic self-completion holds that to define themselves, humans sometimes assert indicators of achievement that either they do not have, or that do not mean what they seem to mean. This behavior has consequences for managing project-oriented organizations. I offer email and telephone coaching at both corporate and individual rates. Contact Rick for details at rbrenpejCHUQLkABGUwXJner@ChacgclxgeSfHmuKMqvaoCanyon.com or (650) 787-6475, or toll-free in the continental US at (866) 378-5470.